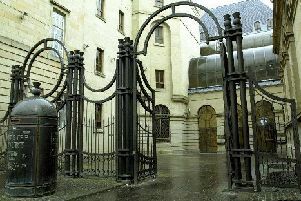 At the High Court in Edinburgh today, two teenagers were found guilty of the murder of former Newbattle Community High pupil Brett Lodge. A third was convicted of assault of their 17-year-old friend, Brett Lodge, on a path between Edinburgh’s Claverhouse Drive and Glendinning Crescent. Declan Robertson, Andrew Parfinowski and Cameron McKail attacked Mr Lodge with baseball bats in the street on 1 July 2011. Robertson and Parfinowski, who were found guilty of murder, and McKail who was found guilty of assault, were all aged 16 at the time of the incident. Procurator Fiscal for Edinburgh, Michelle Macleod, said: “This was an appalling act of violence against a young man by a group of teenagers. “Brett Lodge was repeatedly punched, hit on the head and body with baseball bats, and kicked while he lay unconscious on the ground. “He died nine days later in hospital having never recovered from the catastrophic brain injuries he suffered. “I know the months since the murder have been an ordeal for his mother and family.